In the June newsletter, I provided a look at the amazing gardens that we visited this past May on our riverboat trip to the Netherlands and Belgium. In July I shared my impressions of the historical and cultural features of the Netherlands. This month, I would like to pick up where we left off by focusing on the historical and cultural features of Belgium, a country with a tumultuous history that has resulted in a fascinating culture. The contrasts between the bustling, futuristic city of Rotterdam, the last Dutch city that we visited before crossing into Belgium, and the medieval city of Antwerp, the first city of Belgium that we visited, were stunning and charming. Antwerp has an ancient quality, partly because it did not suffer the aerial bombing that Rotterdam went through during World War II and partly because the people have lovingly preserved their history. It is a city of castles, churches, and guildhalls; but it is also a city of statues, four of which featured prominently in our walking tour of this remarkable old city. 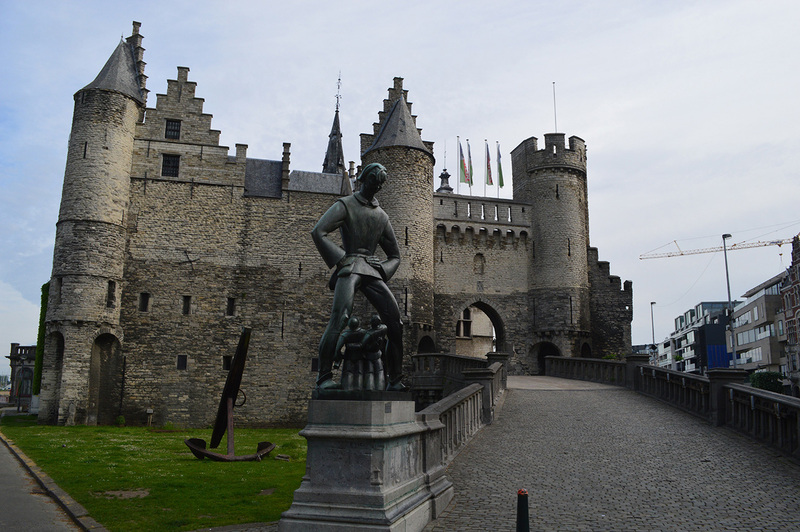 We began our walk at Het Steen, a beautiful 16th century castle once used to protect the city from the Vikings. Only a small portion of the original building still stands, but its ornate doors, windows, statuary, and other medieval architectural features sent my imagination soaring and my camera shutter snapping. In front of this imposing structure is a large statue of Lange Wapper, a legendary shapeshifter who loved to play tricks on the people of this region. This creature was afraid of the Holy Mother, so the townspeople erected numerous statues of Mary throughout the city to protect them from his crude and dangerous pranks. 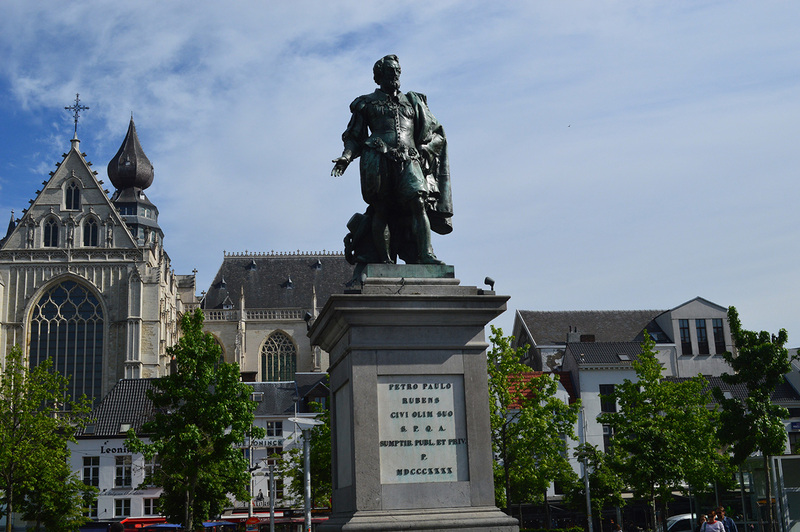 Next, we walked to the Grote Markt, the great market square at the heart of the old city, where we admired the palatial city hall, the numerous 16th century guildhalls, and a monumental statue of Brabo, a character from Flemish folklore who defeated a giant named Druon Antigoon. According to the legend, Druon guarded the entrance to the city and charged a toll of any who passed. If refused payment, he would cut off that person's hand and throw it into the Schelde River. He was forced from this cruel practice by a brave young Roman soldier who cut the giant's own hand off and cast it into the river. 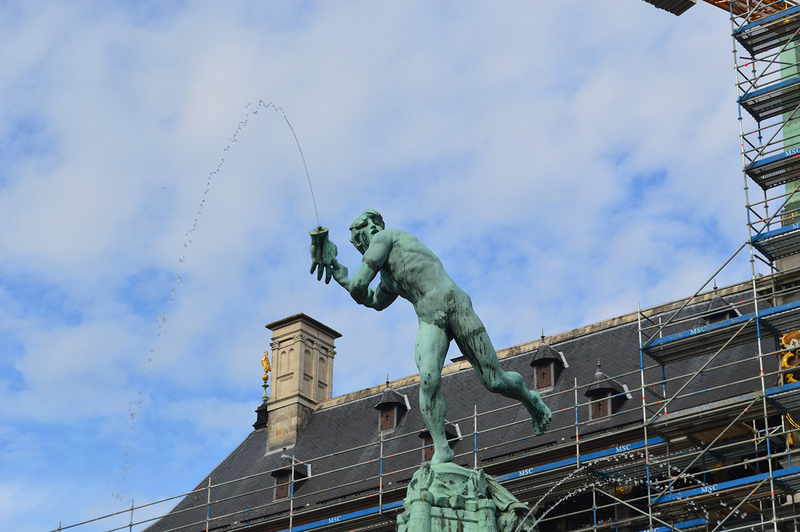 Antwerp's name comes from this legend, as it means "throwing the hand" in Flemish. A less grisly statue is found a few blocks away. 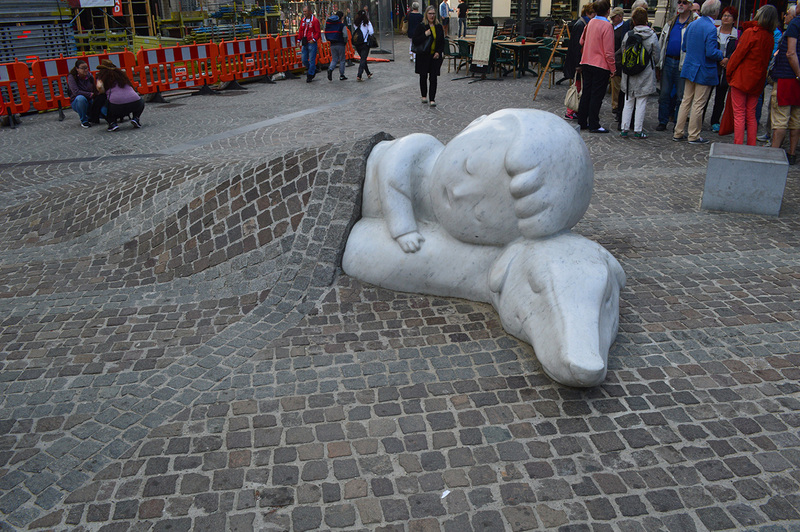 In front of the Cathedral of Our Lady, the marble image of a little boy and his dog is built into the cobblestone pavement, a memorial to the main characters from a famous children's book, A Dog of Flanders, published in 1872 by Marie Louise de la Ramee. A British author and animal rights activist, Ramee wrote the story after visiting Antwerp and decided to use this charming city as its setting. Peter Paul Rubens, the famous Belgian painter and native of Antwerp, was featured in the book because the little boy was an aspiring artist. Inside the cathedral, numerous paintings by Rubens hang on the walls. The cathedral itself is an architectural wonder and contains an amazing collection of masterpieces by a variety of sculptors, woodworkers, stained-glass artisans, and painters. A short walk from the cathedral is the fourth important statue that we visited. It is a bronze image of Antwerp's most famous artist and the one featured in A Dog of Flanders, Peter Paul Rubens, who lived here from 1587 until he died in 1640. His prolific production and his incredible skill have given him a worldwide reputation and led to his work being displayed in museums and churches around the world. 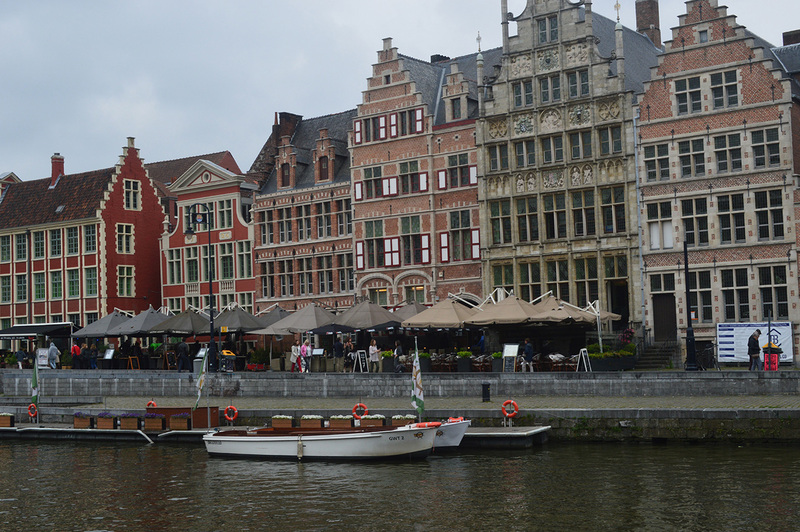 From Antwerp, our boat followed the Schelde River through the Suis Terneuzen Lock and into the Ghent-Terneuzen Canal to the beautiful medieval city of Ghent, the second largest city of the East Flanders province with a population of about 250,000. Some of its buildings date back to the 7th century, and many have been preserved or restored so that walking the ancient streets is like traveling back in time. One GardenSMART episode was filmed at the Ghent University Botanic Garden, a wonderful display garden for students and the public, but the city has much more to offer. The skyline is known for three towers that rise proudly almost 300 feet into the air and make this a UNESCO World Heritage Site: St. Bavo's Cathedral, the 1313 Belfry, and St. Nicholas' Church. St. Bavo's contains some extraordinary art work, including Rubens' "Calvary Triptych" and Hubert and Jan van Eyck's "Adoration of the Mystic Lamb" or the Ghent Altarpiece. Exploring these amazing buildings that reach for the sky provides a lesson in Gothic architecture as well as some insight into the wealth and aspirations of the people of Ghent. 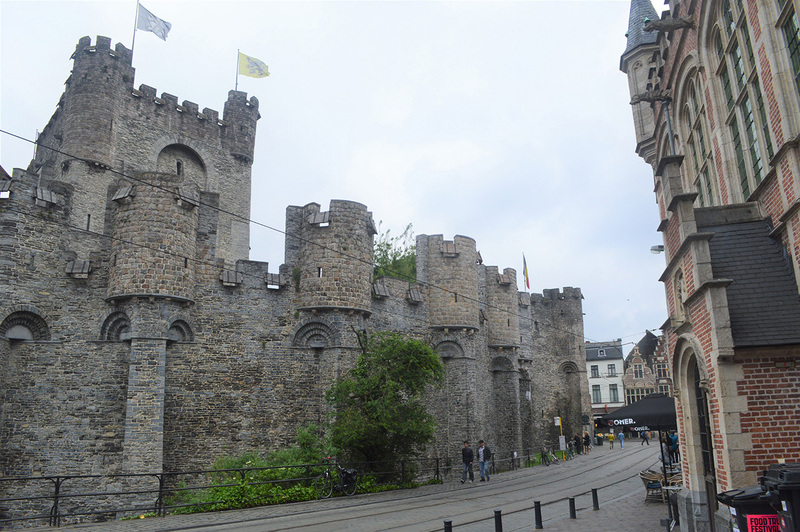 My favorite building, however, was Gravensteen or the Castle of the Counts, the quintessential castle complete with a knight's hall, a torture chamber, turrets, arrow slits, and thick stone walls. It is just what I imagined as a boy daydreaming about King Arthur and the Knights of the Round Table. Built in 1180 by Count Philip of Alsace, this castle provides quite a workout if you climb all of its 423 steps, but exploring its many rooms and levels is worth the effort. 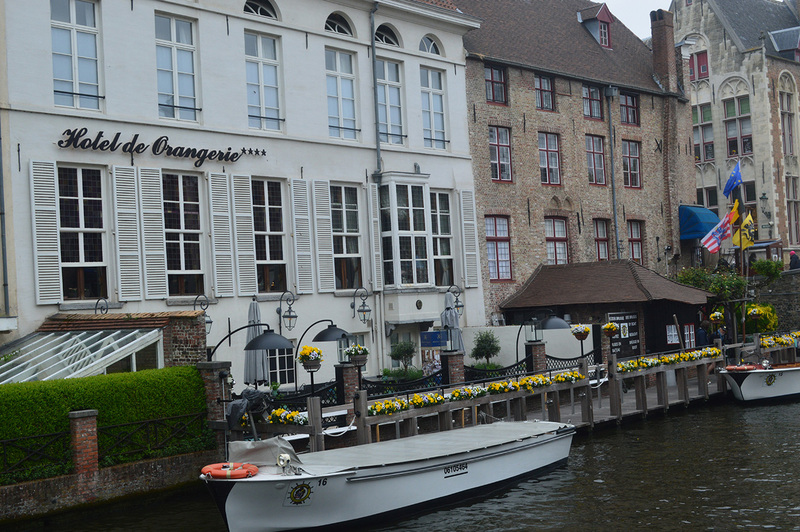 The next morning, we boarded buses for a short trip to Bruges, perhaps the most beautiful and romantic city in the region. Sometimes called "the Venice of the North," Bruges was built on a series of canals that connected to the North Sea and made it an important and wealthy trade center in the 13th through the 16th centuries. It still retains its Gothic look and charm and was named a UNESCO World Heritage City because it has preserved its historic city center so well. 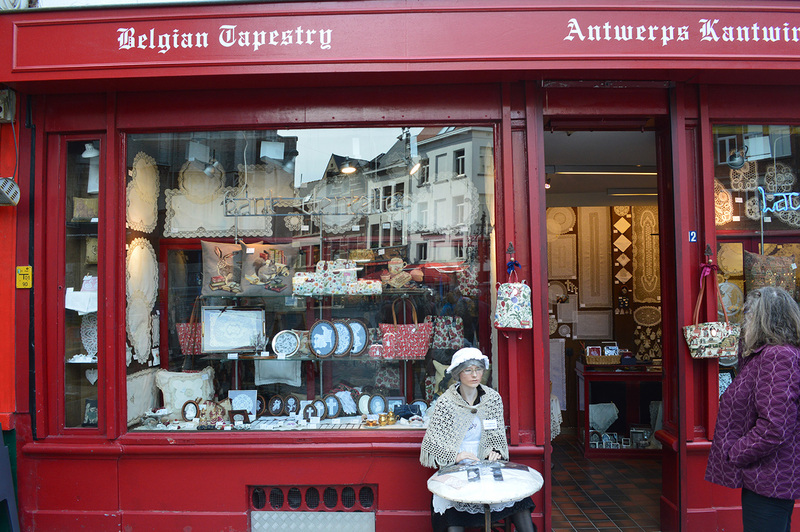 Today visitors enjoy cruising the picturesque canals, watching skilled craftsmen make Belgian lace, sampling Belgian fried potatoes with mayonnaise or some of the excellent chocolate made locally, and learning about medieval hospitals at Old Saint John's Hospital Museum, one of the oldest surviving hospital buildings in Europe. My favorite part of the tour was seeing Michelangelo's Mother and Child sculpture at the Church of Our Lady, an amazing work of art that I first learned about in the 2014 movie The Monument Men, based on a true story about a U.S. Army unit who recovered a large cache of art masterpieces stolen by the Nazis. Of course, food was an important part of our riverboat cruise. 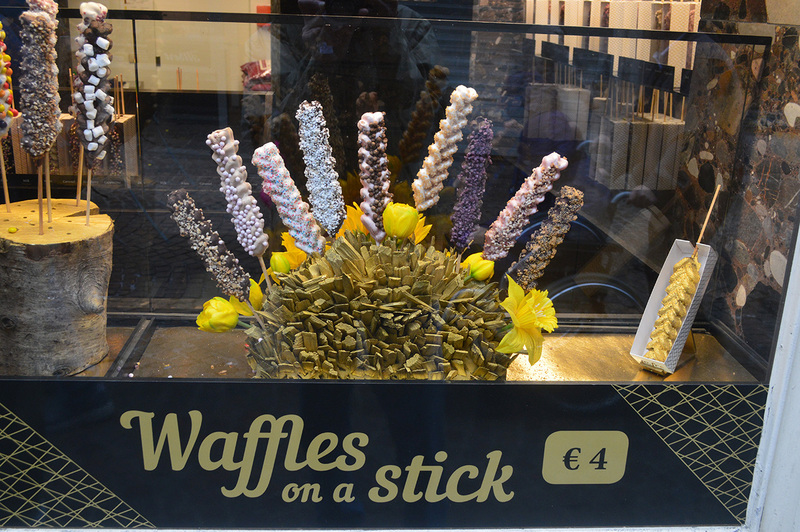 We sampled the local cuisine on our daily excursions, usually just a quick snack—some fresh strawberries in Rotterdam, a delicious Belgian waffle in Ghent, meatballs in tomato sauce in Antwerp, chocolate truffles in Bruges, smoked mackerel in Amsterdam, etc. However, we took most of our meals onboard the riverboat. The chef and kitchen staff on the Amadeus Silver III prepared a delicious breakfast buffet each morning, two versions of lunch at noon each day, and five-course meals for us every evening, using locally sourced ingredients and locally inspired recipes. This allowed us to learn about Belgian and Dutch cuisine as we traveled. 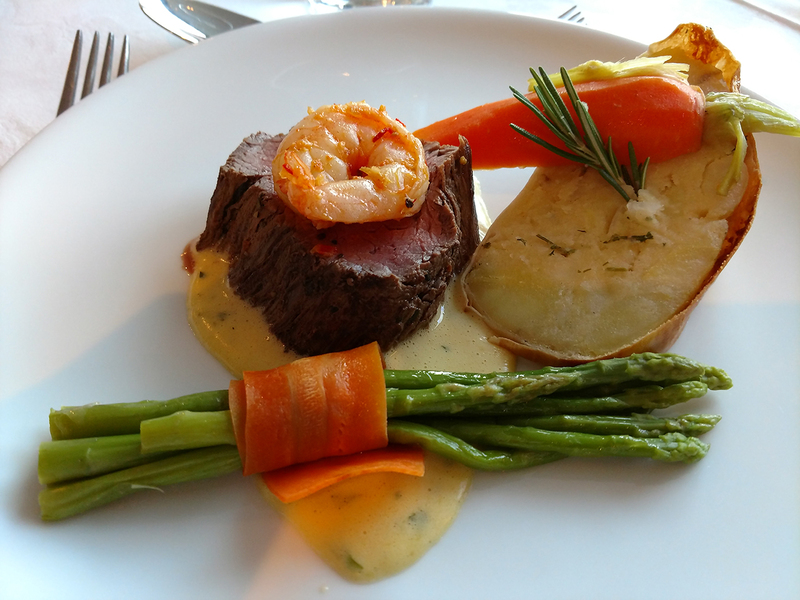 My favorite meal was served at the captain's gala dinner on the last evening of the cruise. It was a seven-course extravaganza that began with a marinated beef carpaccio salad, followed by lobster bisque with cognac and fresh cream, and ravioli porcini with truffle sauce. To cleanse the palate, we had a delicious cassis sorbet with ginger and spearmint. The main course was beef tenderloin and grilled black tiger prawn with Béarnaise sauce, a green asparagus bundle, and potato strudel. After the chef and his assistants paraded a beautiful baked Alaska through the dining room with sparklers ablaze, we were each served a slice of this tempting dessert as the final course. Our tour of the Netherlands and Belgium took us to some world-class gardens, but it also taught us about the history, art, architecture, and cuisine of these beautiful countries. Watching the GardenSMART crew filming some segments for the show was particularly fun and educational. I am really looking forward to watching these seven episodes of GardenSMART when they begin airing on PBS this fall. No doubt they will help me relive the trip and enjoy it all over again.